The Wars of Pooch: So, what next? As of this morning, I finished the last of the Myrmidons. Now sadly, because the Analogue challenge is still on, you are just going to have to wait until tomorrow to see the whole lot up on here! 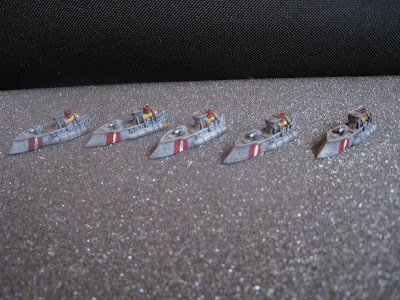 But along with my Hoplites, I managed to get a bit of painting done on some additihons to my Dystopian Wars Brittanian Fleet. Red Squadron of Corvettes. Light, fast and sneaky! Blue Squadron of Corvettes. Also, light, fast and sneaky! A squadron of 3 Agincourt Gunships. Not so light, not so sneaky, not so fast. Big guns and torpedoes however! So, with the addition of those, again I have painted everything I want (so far) for my Dystopian Wars fleet! 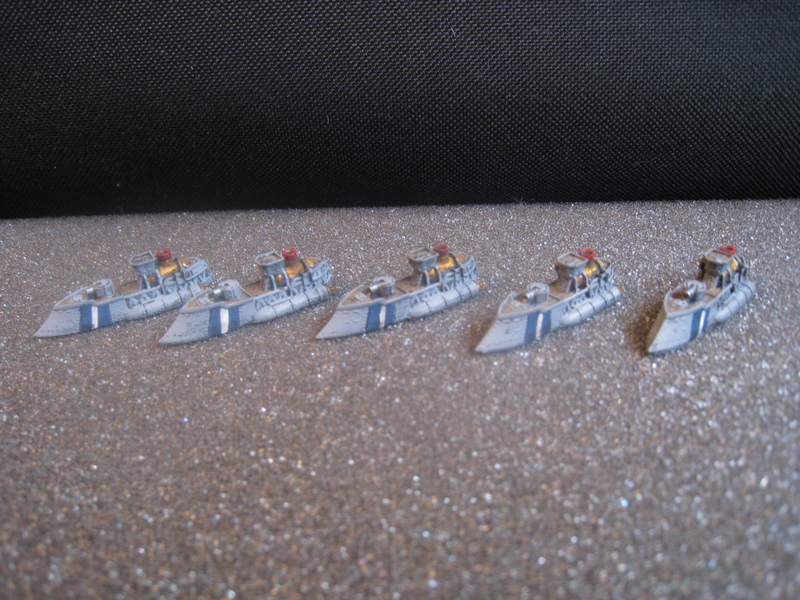 I just need to get them out sailing in our campaign, before that runs out of steam! So, with my Greeks for SAGA finished, I have reached a bit of an impass. There is exactly one month remaining in the Analogue Hobbies painting competition, and I would like to get a bit more painting done before then! I think I will aim for an honourable 2nd place behind the painting cyborg (Kent). -Thirty Years War Spanish- Because Tercios are awesome! 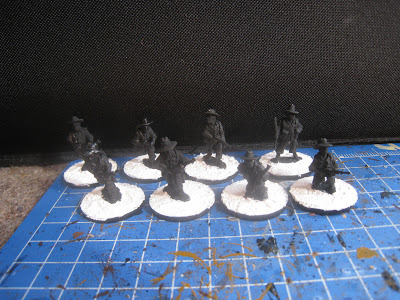 -Some other historical 28mm army for Impetvs? Thats where I am at right now, in addition to one of those (or maybe more than one if it is in 15mm!) there will also be super secret project number #1 getting finished! What do you mean "worst kept secret since Roswell?" But more on that later, and come back tomorrow for my entire Myrmidon army on display! I think DW will keep ticking on, since we aren't trying to play many games. Give it 6 months to a year and we should have a result. 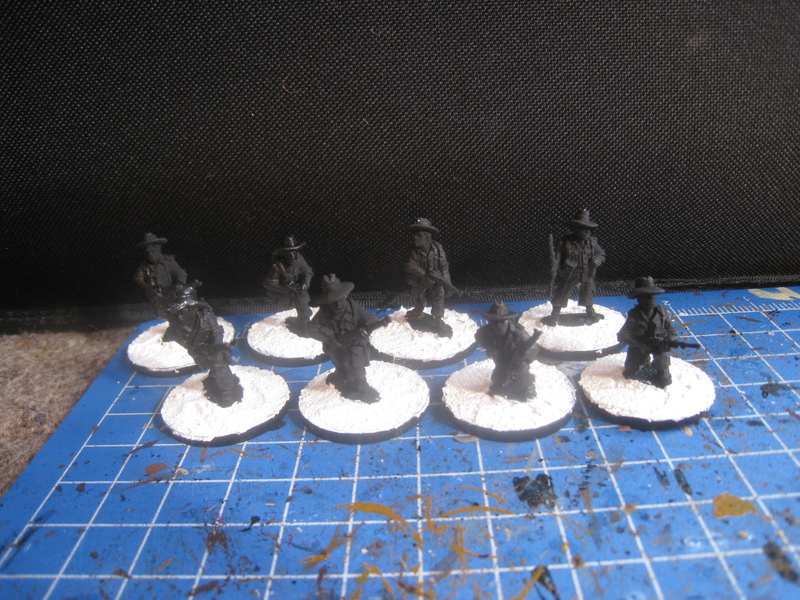 If you have the models - then do the Impetus and SAGA stuff (and/or the Pacific stuff?). 28mm is the most interesting gaming scale. 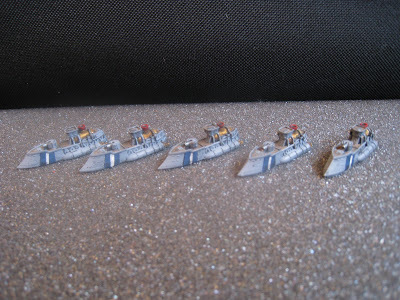 Otherwise, go for the points with all the 15mm for FOW? Thought you might say SAGA Jamie- It would be good to have my Saxons ready to go as soon as the next book comes out. Impetus will require an order, unless it is the TYW stuff which I have already got. FOW is tempting, getting some EW going at the club would be great, and V3 is just cool! Did someone say something about Operation Watchtower? Do you really believe that the Aginconts are worth their point values at 80 points a model?!? 80 points is pretty steep! Probably not pound for pound. But, considering the fleet requirements that you HAVE to have something in the medium tonnage, I think I like the Agincourt more than I do the Tribal- the extra firepower of the gunship, coupled with the higher DR AND shield combo I think will make them a more common occurence in my fleet than the lighter tribal class cruisers. So in your opinion what would be better? The Agincourts or the Vanguard submarines because those are considered mediums. 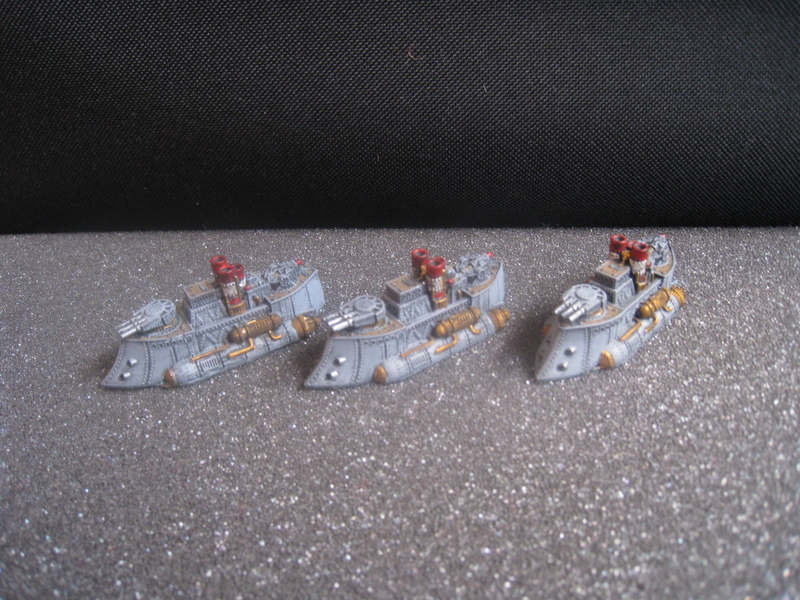 Tough call- Vanguards have that whole "chainsaw submarine" thing going for them! I think it is a call based on flavour for me, game terms? Vanguards are much better. Boarding from three of them is ruthless! But to me, a fleet doesn't "look" right without some of the cruiser class, so I expect me to use the Agincourts more than the Vanguards. 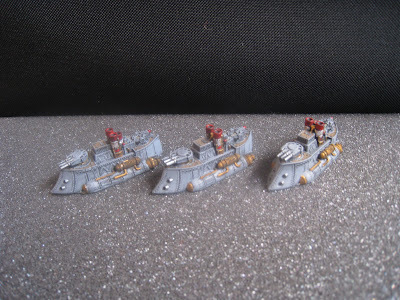 Chainsaw submarines are frickin cool.